I just wanted to share a wonderful experience I had last week in Henderson, KY. I was there from Sunday, April 15th through Sunday, April 22nd visiting a variety of schools and sharing my vocation story. You may be wondering just how I ended up going to a little city out in the country. To find out, read on! Last summer, I had the chance to speak at the 12th National Black Catholic Congress in Orlando, FL, where I also proclaimed the reading during Mass at the Basilica of the National Shrine of Mary Queen of the Universe. The group traveled together to and from Mass on a bus, and it was on this bus that I met Father Anthony Shonis. After some lively conversation, Father Shonis extended the invitation that eventually brought me to the Diocese of Henderson, KY. While in Kentucky, I had a full itinerary - I spoke the night I arrived, every day thereafter, and then again on the very morning I left. I met with groups of all ages at schools across the diocese. My youngest audience included pre-kindergarten, but I also spoke with children in elementary, middle, and high school. Teaching the little ones a chant with some movement! After my story and explanations, I allowed time for the kids to ask me questions. I received excellent questions from every grade, including some interesting ones such as "What happens if you break the vows? "; "What do you think you would be doing right now if you weren't a sister? "; and "How do you pay for all of your travels?" My favorite question, however, came on the last day. After Mass, I spoke with the kids who came from the public schools for religious education. It was a mixed group, so there were children from elementary to high school present. When I finished speaking and invited questions from the students, a little boy in the front row raised his hand high and asked, "Is all of this true?" I held my laughter in behind a great big smile and said, "It is, actually! It's pretty much my whole life story all in one very short presentation." He stared at me in awe as I continued answering some other very good questions. After all of the questions had been asked and answered during my presentation, I did one of two things. With the lower grades - usually kindergarten through fifth grade - I would teach the students a chant with some movements I had made up. The kids had a great time, jumping up and down and using their 'outside' voices even though they were inside. One of the teachers came to me afterward and said, "That was great! We're going to use that as opening prayer from now on!" With the middle and high school students, I would do something a little different. I had some choreography prepared that went with a popular song all the students knew, so it was a nice surprise for them to see I could dance. The older kids loved it! They started bouncing around as soon as the song came on, but they also had a great time learning the dance and competing to see who could do it best. I received several compliments afterward, from both middle and high school students, and sometimes even from their teachers who had gotten up and tried the dance, too. At one point, Father Anthony Shonis even tried learning the dance! Near the end of my time in Kentucky, I was blessed to be able to speak at the annual Black Catholic gathering for the diocese of Henderson. The day began with breakfast and Mass, followed by a short Q&A session with the bishop. Afterward, everyone moved to the parish hall where I spoke with the small group of about 20 people in attendance. The theme was "Missionary Discipleship from a Multicultural Perspective: Effective Inclusion." I shared my story and focused on how God has been able to break barriers in and around me simply through my "Yes." Explaining that it was not necessarily my intent to break these barriers, I shared that now I know it was God's intent and that my choice to follow His will is what allows me to be a voice for the minorities I represent. Several of the individuals shared their own difficult stories about racism and prejudice, explaining that they had been mad at God, wondering why He would make them "like this" (African American/black) if it meant they were going to be mistreated. 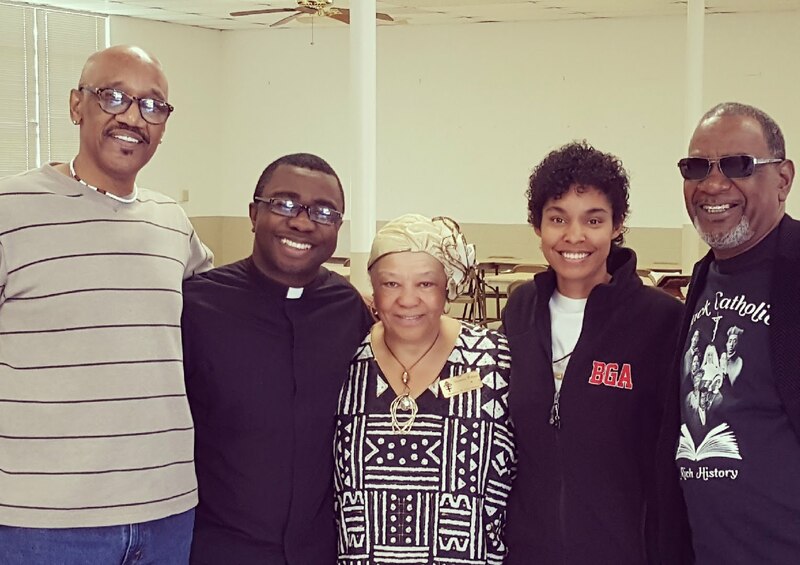 In the course of the sharing, many individuals expressed their gratitude for groups and events like the Black Catholic gathering because it gave them the opportunity to have a place in the Church. As the presentation came to a close, I thanked the group for their invitation and for their sharing. I explained, "I fall into many minority groups - I'm a minority as a woman of color; I'm a minority as a woman of color who's Catholic; I'm a minority as a young sister; I'm a minority as a young sister who's black; so a lot of people have begun turning to me, asking for my opinions. They see me and say, 'There are not many of you. We want to know what you think.' Now that you have shared your stories, I will join your voices with mine so we can speak together when people ask me what I think." I can hardly express the joy and beauty I experienced in Kentucky. It confirmed the hopes I'd had when I first began to contemplate religious life seriously - hopes that God would use my gifts and life for a purpose, and that my relationship with God and the world around and within me would deepen. I can only describe it in this way: I felt as if I were being lifted to God by all of my Felician Sisters at once; like I was in the middle of a wonderful celebration where all at the same time I was learning, loving, and laughing. It was like looking up at the sky right when the shooting star made its appearance; like knowing I am right where I am meant to be.